EUGENE, Oregon – Kendall Ellis carried the weight of Southern California’s national title hopes on her back during the anchor leg of the 4×400 relay. The Women of Troy had to win the relay to capture their first outdoor national title since 2001. It didn’t get much easier for Ellis when she and Deanna Hill mishandled the exchange. Ellis gathered the baton and took off in fifth place, two seconds off the lead set by Purdue. One by one, Ellis picked off those in front of her. Ellis eventually tracked down Purdue’s Jahneya Mitchell with less than five meters to go and gave Southern California the title by one point over runner-up Georgia. This is the second year in a row that the Bulldogs’ championship aspirations were dashed by the result of the 4×400. 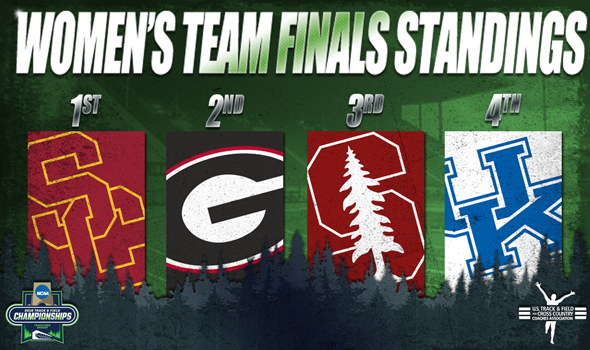 This is how close the race was for the team title: Southern California 53, Georgia 52, Stanford 51 and Kentucky 46. First through third was separated by just two points. The Women of Troy received 12 points in the 200 – including 10 from surprise champion in Anglerne Annelus – 10 from that 4×400 relay, eight in the 100, eight in the 400 (Ellis), eight in the 400 hurdles (Anna Cockrell), six in the 4×100 and one in the long jump from Madisen Richards. Keturah Orji and Lynna Irby paced the Bulldogs, like they have all season long. Orji became the first woman since Florida State’s Kim Williams in 2009 to sweep the long jump and triple jump at the same NCAA DI outdoor meet. Irby won the 400 in a meet-record time of 49.80 – which is also the second fastest time in collegiate outdoor history – and finished third in the 200 for 16 total points. Stanford used a historic first day to put itself in position to tie its best finish at the NCAA meet. Mackenzie Little and Jenna Gray became the first female teammates to finish 1-2 in the javelin in NCAA DI history. The Cardinal also scored points in the 800, 1500, 5000, discus, hammer and shot put. Kentucky picked up three individual national titles – Jasmine Camacho-Quinn in the 100 hurdles, Olivia Gruver in the pole vault and Sydney McLaughlin in the 400 hurdles – and added 16 more points in the relays and triple jump combined.